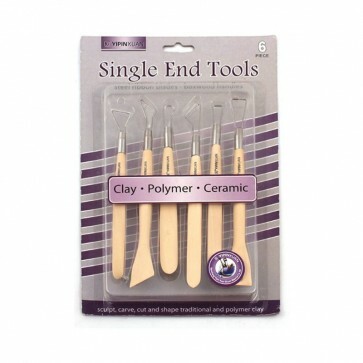 This 6 piece set contains a variety of thin steel ribbon blades in an assortment of shapes and sizes. The metal ends sculpt, carve, cut, and shape traditional and polymer clay. The boxwood handles also double as sculpting tools that can be used in multiple ways. These tools are invaciated for creating intricate details when producing smaller objects. YipinXuan Single End Clay Wooden Tools 6-pcs Set Steel Ribbon Blades - Boxwood Handles This 6 piece set contains a variety of thin steel ribbon blades in an assortment of shapes and sizes. The metal ends sculpt, carve, cut, and shape traditional and polymer clay. The boxwood handles also double as sculpting tools that can be used in multiple ways. These tools are invaciated for creating intricate details when producing smaller objects.